WEST COVINA >> Detectives Thursday arrested the second of two suspects accused of robbing a taxi cab driver after ordering a ride to Galster Park in West Covina. The crime took place about 5:30 a.m. Wednesday at the park, along Aroma Drive at Galster Way, West Covina police Lt. Jerry Pearman said. The suspects ordered a taxi ride in another city and had the driver take them to the secluded park, he said. “It was a set-up,” Pearman said. The suspects allegedly pulled a gun and demanded the driver’s property, including his money and cell phone. The lieutenant said the driver turned over the items and was not injured. The robbers fled, and police searching the area did not find them. But detectives continues working the case and were able to use the stolen cell phone to track the male suspect to a neighborhood not far from the park, Pearman said. They watched as the man tried to drive away, then pulled over his car and took him into custody. Detectives found and arrested the female suspect while serving a search warrant on Thursday, he said. Both suspects were booked on suspicion of robbery, Pearman said. Their identities were not available Thursday afternoon. SAN MARINO >> Police arrested a man and woman from San Gabriel in connection with a series of burglaries and other theft-related crimes after they broke into a San Marino home through a doggy door Tuesday, officials said. Arthur Edward Hernandez, 31, and Tracey Lee Viera, 42, were booked on suspicion of burglary, grand theft, identity theft, receiving stolen property and trespassing following their arrests shortly after 9 a.m. in the 2300 block of Robles Avenue, according to San Marino police and Los Angeles County booking records. A resident called police to report a unfamiliar black Acura was parked in their driveway, San Marino police Sergeant Tim Tebbetts said in a written statement. “Officers arrived on scene within two minutes caught two suspects attempting to remove property from the location,” Tebbetts said. They were detained without a struggle. Police found items from the home deposited around the house and backyard in advance of a quick getaway, the sergeant said. The suspects — later identified as Hernandez and Viera — “entered the house by reaching through a dog door and unlocking the rear door,” Tebbetts said. They broke into the house, as well as the detached garage. Officers found several pieces of mail not belonging to the suspects, as well as other suspected stolen items, in the suspects’ car, police said. “Officers were able to link both suspects to two other burglaries in San Marino and one burglary in Pasadena,” Tebbetts said. Detectives are seeking any additional victims of the burglars. Hernandez and Viera were being held in lieu of $50,000 each pending their initial court appearances, scheduled Thursday in Alhambra Superior Court, records show. MONTEBELLO >> A SWAT team used teargas and a K-9 to apprehend a suspect following an hours-long standoff at a Montebello apartment complex late Tuesday into early Wednesday, police said. 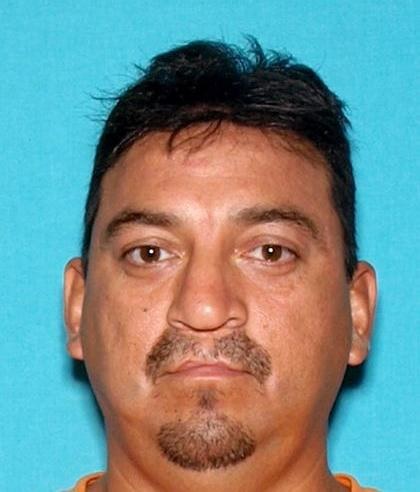 Edward Palacios, 39, of Montebello was ultimately arrested on suspicion of making criminal threats, assault with a deadly weapon and resisting or obstructing police the standoff, which began about 11 p.m. Tuesday in the 200 block of S. 7th Street, Montebello police Capt. Luis Lopez said in a written statement. A family member of Palacios called police a short time earlier to report the suspect had threatened him with a gun, Lopez said. Police learned a woman, Palacios’ girlfriend, was also inside the apartment, Sgt. Julio Calleros said. The woman, who was not being held against her will, exited the apartment amid the standoff. She was not arrested. But Palacios refused to surrender, remaining holed-up inside the apartment, police. A Los Angeles County sheriff’s Special Enforcement Bureau team was summoned to take over the standoff. After several hours, deputies used teargas to smoke Palacios out of the apartment, Calleros said. He continued to struggle once outside and was apprehended with the help of a police dog. Palacios was taken to a hospital for treatment of dog bites described as minor to moderate prior to booking, officials said. He was expected to be held without bail pending his initial court appearance. PHOTOS: [TOP] Edward Palacios booking photo courtesy of the Montebello Police Department. 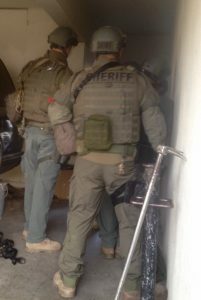 [BELOW] Sheriff’s Special Enforcement Bureau deputies during standoff, courtesy of the Los Angeles County Sheriff’s Department. SOUTH PASADENA >> Police arrested a Los Angeles man suspect who went on an alleged crime spree Wednesday morning, sexually assaulting two teenage girls and one woman before breaking into five apartment in the south end of South Pasadena, authorities said. The identity of the 22-year-old suspect, who was already on parole for burglary, was withheld as police continued following up investigative leads Wednesday afternoon, South Pasadena police Capt. Brian Solinski said during a press conference. Immediately afterward, Solinski said the man began a burglary spree, breaking into five apartments in the same general neighborhood, Solinski said. Detectives determined the same man was responsible for all eight crimes reported in South Pasadena early Wednesday. MONTEBELLO >> A former Montebello police officer charged with slamming a tagging suspect’s head into the pavement during an arrest will avoid jail time after pleading guilty to a misdemeanor charge Tuesday, authorities said. Mark Jason Ryan, 37, pleaded guilty to one misdemeanor count of assault under color of authority in Los Angeles County Superior Court in Los Angeles at what was scheduled to be a hearing to set a date for his preliminary hearing, Los Angeles County District Attorney’s Office spokeswoman Jane Robison said. He was immediately sentenced to 36 months of summary probation and 300 hours of community service, and ordered to stay 100 yards away from the victim for the term of his probation, Robison said. Prosecutors initially filed a felony charge against Ryan for the on-duty attack, which took place on Halloween of 2014. If convicted of the felony charge, Ryan could have faced up to three years in state prison. Ryan worked as a corporal with the Montebello Police Department when he responded to a report of two men tagging in the 2100 block of West Whittier Boulevard. While arresting then 26-year-old Anthony Acosta, Ryan slammed Acosta’s head into the pavement in an unjustified assault, prosecutors said. “He was roughed up pretty good,” said Acosta’s father, Oscar Acosta said. His son, who already suffered from mental health issues, remains depressed and anxious and has been dealing with memory loss issues since the incident. “Since it happened, he hasn’t been the same,” Oscar Acosta said. And even following the conviction, the victim, his family and their attorney, Brian Claypool of the Pasadena-based Claypool Law Firm, said they have many questions about exactly what happened that day. Oscar Acosta said he and his son first learned of the arrest through media reports and were not notified of the pending plea arrangement. While the assault was reportedly captured on video by the surveillance camera of a nearby restaurant, authorities have not released the video. Since the case ended in a plea arrangement prior to trial, the video was not entered into evidence and would not be released by the district attorney’s office, Robison said. Montebello Police Chief Kevin McClure deferred to the district attorney’s office regarding the video. “Everything evidentiary was turned over to the District Attorney and they have authority over it,” he said in an email. Claypool said he intended to file a lawsuit to pursue more information. “We plan on getting to the bottom of this. We want to see that video tape,” he said. “We’re going to file a civil lawsuit,” Claypool said. “We’re also going to file a preservation of evidence letter,” Claypool said, which would seek to prevent authorities from deleting or discarding any video or other evidence. Ryan retired from the Montebello Police Department in early 2016, officials said. Ryan served as president of the Montebello Police Officers’ Association in 2015. McClure declined to comment on Tuesday’s conviction. Ryan was scheduled to return to court for a probation progress report in one year, Robison said. ANGELES NATIONAL FOREST >> A man lost an arm and was hospitalized in critical condition after an offroading accident in the Angeles National Forest near the San Gabriel Reservoir, officials said. The crash took place about 2:10 p.m. in an off-highway vehicle area along mile marker 23.25 of San Gabriel Canyon Road, according to California Highway Patrol and Los Angeles County Fire Department officials. The victim, a man estimated to be in his 40s or 50s, had just climbed a steep hill in a wide-axle, Jeep-style vehicle, fire Capt. Marc Scott said. The man was descending the hill when the vehicle overturned, throwing him from the truck, the captain said. The rolling vehicle landed on one of the man’s arms, severing it. Fellow offroaders called for help, Scott said. U.S. Forest Service officials and county firefighters rushed to the scene, where they found the man unconscious, Scott said. Paramedics flew the man to a Pasadena hospital by helicopter, officials said. He was listed in critical condition. It was unclear whether doctors would be able to reattach the severed limb. The crash is being investigated by the Baldwin Park area office of the CHP. PASADENA >> Police disarmed and arrested a Pasadena man seen sitting on a front porch, waiving a handgun and yelling incoherently Saturday afternoon. Alfred Montoya, 59, was booked for brandishing a firearm following the 6 p.m. incident in the 700 block of North Chester Avenue, Pasadena police Lt. John Mercado said. Police received reports of Montoya sitting on the front porch of someone else’s home, “yelling and holding a handgun,” Mercado said. It was unclear what the man was upset about. “He was yelling incoherently,” the lieutenant said. Once officers arrived, Montoya obeyed commands to put down his gun and surrender. The home he sat in front of was not his, but it was unclear whether he knew the residents, he added. Officials were looking into the possibilities that intoxication or mental illness may have played a role in the incident. According to Los Angeles County booking records, Montoya was released from jail later in the day pending his initial court appearance after posting $25,000 bail. PASADENA >> Police found bullet casings from two different guns and a shattered car window, but no victims, after gunfire erupted in a northwest Pasadena neighborhood early Sunday, authorities said. Numerous residents called 911 to report gunshots in the 100 block of West Washington Boulevard, near Navarro Street, Pasadena police Lt. John Mercado said. Officers ultimately found two separate groups of spent bullet casings along the street in the area, the lieutenant said. One of the groups of shell casings were from a 9mm handgun, while the other was from a .32-caliber handgun. Police also noted the rear window had been shot out of a parked car. But no victims were found at the scene, and a check of area hospitals also turned up no victims of the shooting, Mercado said. No description of the shooters was available. It remained unclear whether the shooting had been a gunfight between two people, or if two shooters had fire their guns in concert. MONTEBELLO>> Ten horses died in a fire that tore through a Montebello stable early Sunday, officials said. The fire was first reported a few minutes after midnight at a large stable in the 300 block of South Bluff Road. It quickly grew to consume a 120-foot by 170-foot section of the large stable, Montebello Fire Department Battalion Chief Richard Fredrickson said. “It took about an hour for us to get more-or-less control,” he said. The fire was declared extinguished about two hours after it began. Ten horses inside the stables died in the fire, Fredrickson said. No people were hurt. Montebello police and firefighters managed to evacuate another 22 horses unharmed, according to Montebello police and fire officials. Representatives of the stable could not be reached for comment Sunday. The cause of the fire remained under investigation, Fredrickson said. “We’re still looking into everything. We haven’t ruled anything out,” the battalion chief said. Police had not been asked to get involved to get involved investigation Sunday, Montebello police Lt. Rick Rojas said. A dollar-value estimate of the damage was not available.